As cultural family getaways go, there are countless destinations to choose from - ranging from beach tropical settings to city locales. However, an increasing number of families are in search of holiday destinations that are slightly "off the beaten path". Still, opting for such destinations doesn't mean you have to forego some of the more enjoyable "touristy" aspects of a holiday - such as museums, landmarks, festivals and more. If you're looking for a cultural getaway destination to take the whole family, but don't necessarily want the crowds, head to Paphos, Cyprus - a gem in the Mediterranean region. A small town located on the southwestern tip of Cyprus, Paphos has much to offer families who want all the great aspects of a cultural getaway, without all the tourists. Renowned as the birthplace of Greek goddess Aphrodite - the goddess of love and beauty - it's already apparent that Paphos has a certain historic allure to it. But this notion is soon fortified by way of Paphos' historical and cultural attractions - from Paphos Archaeological Park and the Tombs of the King, to Paphos Fort - which served as a fort and prison under many administrators. The Odeon, a classic Greek amphitheatre within Paphos Archaeological Park, is also highly worth seeing - and the amphitheatre occasionally holds plays and musical performances, which are a truly special treat. 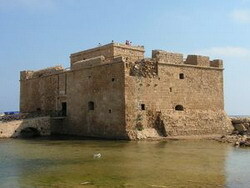 Traveling to Paphos with children? They'll love Paphos Bird Park and Paphos Aphrodite Water Park - a large themed water park boasting plenty of slides, river rides, wave machines, and more. Of course, Paphos is also famous for its many beaches - so whether you want to lounge under the golden sun or partake in some water sports, Paphos offers ideal opportunities to do either. Paphos is also within easy reach of other popular destinations in Cyprus - such as Episkopi and Mandria - enabling you to take day trips from Paphos. 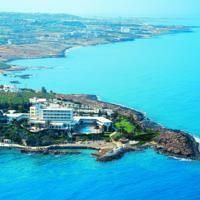 Another great aspect to Paphos is that it can be enjoyed on all budgets. Whether your family wants to take a budget holiday or a luxury getaway, you'll find hotels, restaurants, and activities to suit your spending style. Many activities, such as going to the beach and touring around the town's landmarks, are free - so budget conscious travellers can enjoy an outstanding holiday in Paphos without spending much. Alternatively, you might choose to stay in a 5 star family hotel to receive high-class service, amenities and accommodations. But no matter which way you go about it, you can count on a memorable holiday experience with the whole family in Paphos. Isla Campbell writes for a digital marketing agency. 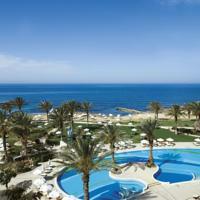 Situated on the beach, overlooking Paphos harbour; just a few minutes walk from the legendary Mosaics. The hotel is an ideal place to stay for those who value luxury and tranquillity, with a touch of style. Guests can stroll on the sandy beach or enjoy the beauty of the landscaped gardens. You can rest and relax in one of the 202 guest rooms with breathtaking views across the blue Mediterranean Sea, as well as enjoy the style, decor and amenities of the rooms. From a candlelit dinner to Flambe specialities or cocktails in a cosy corner of the bar facing the harbour, the setting is splendid and the menu simply wonderful. Located on the beach, Athena Beach Hotel is just 5 minutes from the port of Paphos and is surrounded by vast gardens that reach down to the sandy beach along the timeless blue sea.. All the guestrooms are tastefully decorated and facilitated with modern amenities, providing the much-desired comfort to the guests. Guests can enjoy a variety of delicacies in the cosy atmosphere of the onsite restaurant. Athena Beach Hotel offers flexible meeting rooms for your business conferences, seminars, banquets, cocktail receptions and other social events. Furthermore, guests can take a cool dip in the pool or relax at the sauna during their free time. Set in the outer Paphos, this little bit of paradise wedged between sea and sky is perched on a panoramic headland that could be the edge of the world. Situated in possibly the most unique and beautiful spot in the region, Cynthiana Beach Hotel Paphos is within easy reach of bustling Kato Pafos and some of the most fascinating ruins and archaeological sites on the island. Guests are assured high standards of comfort in all the 230 beautifully appointed rooms and suites. All of them are with private balcony, satellite television and other amenities. Professional and highly motivated staff ensures attentive guest service. Wining and dining in style are amongst the highlights of the hotel. Enjoy live music and pre-dinner drinks and cocktails, served in the intimate atmosphere of the bar. The hotels complex has also an outdoor swimming pool, a large indoor heated pool and is complete with it's own natural lagoon. Just a short stroll from the quaint harbour of Paphos and only 250 meters from the sandy beach, stands the charming low rise buildings of the Paphos Gardens Holiday Resort. This idyllic resort is renowned for its amenities, friendly and attentive service and its extensive entertainment program. Paphos Gardens Hotel Paphos offers individual guestrooms as well as apartments. The apartments are fully furnished and spacious with well-equipped kitchens and also have balcony. The hotel has a la Carte restaurant and three bars, where you can dine and relax with your favourite drink.